Art Trade number two - With Colin Parsons. Check out his site http://www.adeptusbritannicus.com/coppermine/index.php, and don't let the detail fool you into thinking that those models are large, I have seen them, they are in fact minus two centimetres tall. They are tiny. My half - This was very hard. It took me a long time to think of something that would be appropriate. So naturally, I finally decided on making a small werewolf version of Colin himself. You know, as you do. 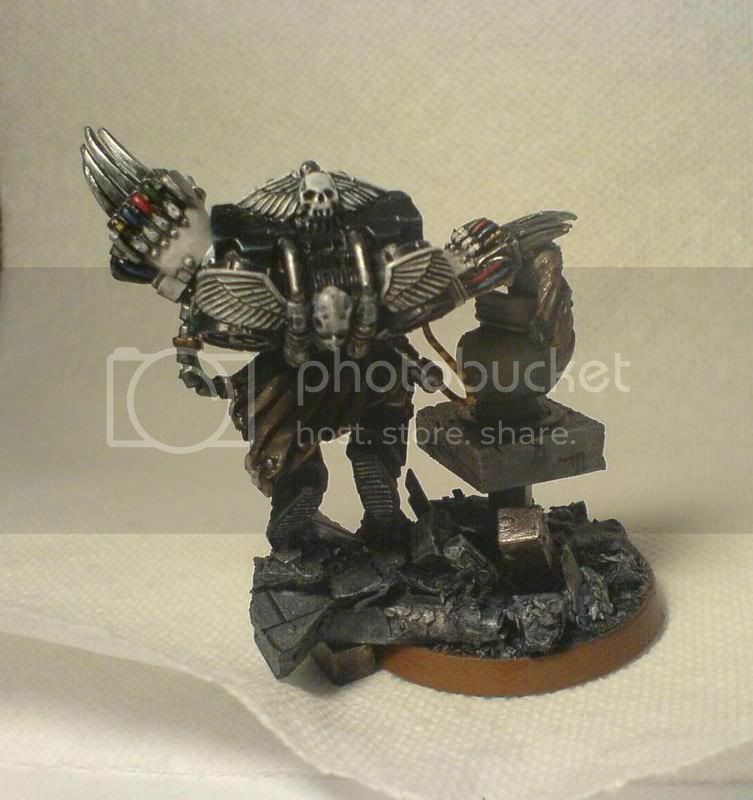 The real Col paints excellent and truly tiny models. 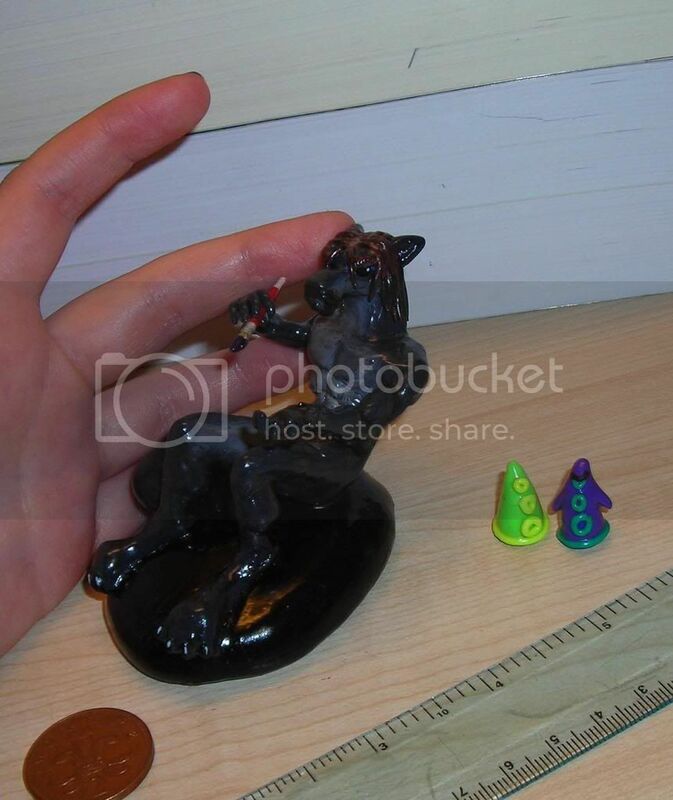 So WerewolfCol is sitting down and painting an excellent and truly tiny model. Col has a beard and moustache and long brown hair (the long haired layabout), so does WerewolfCol. Col has the biggest eyebrows known to man and god. So does WerewolfCol. Col likes The Day of the Tentacle, which is a truly fantastic PC game from the 90s, and if you don't know it I am going to have to insist that you depart and procure yourself a copy right now. The two tiny tentacles are two of the characters from it. 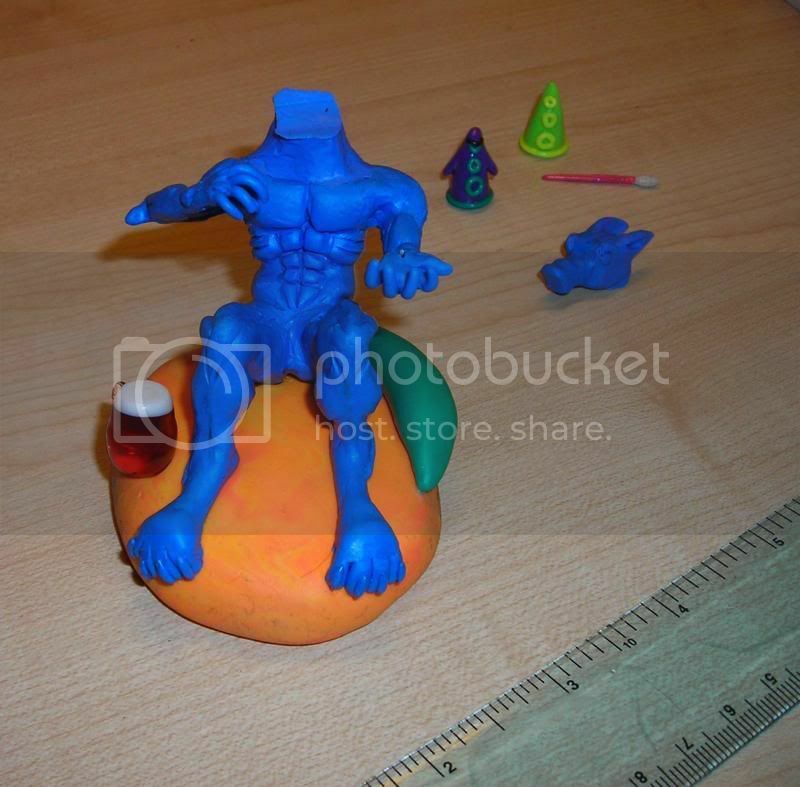 WerewolfCol was created with kiddies plasticine, wire, and acrylic paints. 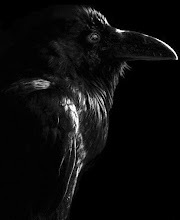 Colin's Half - His own personal take on 'The Raven' by Edgar Allan Poe, my favourite poem. I am afraid that if you do not know of this poem, I am going to have to insist that you leave my site now. And don't let the edoor hit you on the arse on the way out. But for all who know of the poem, please read on. Colin made for me a tiny, intricate model of an Elite Raven Guard General, leaning on a bust. 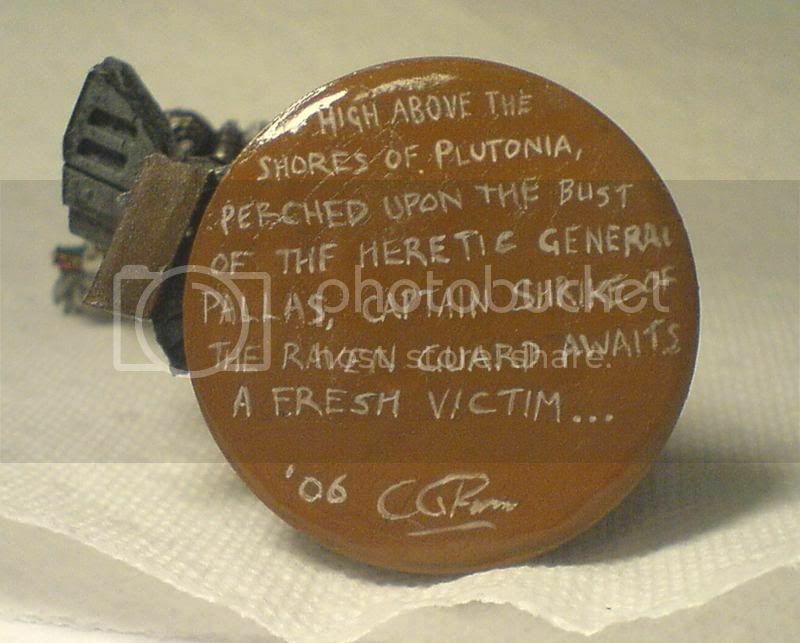 A bust of Pallas, in accordance with my favourite poem. 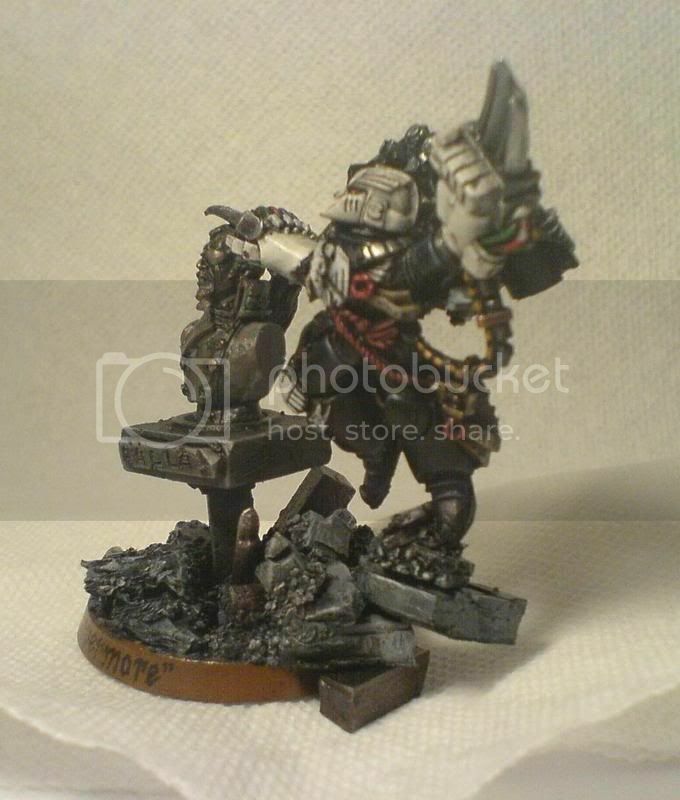 and also Inquisitor Duke Von Castellan; http://uk.games-workshop.com/storefront/store.uk?do=Individual&code=99111399012&orignav=300808. He then, in his own words, 'hacked it up at various places' in order to make the two figures that you see in the final piece. But that's only the start. 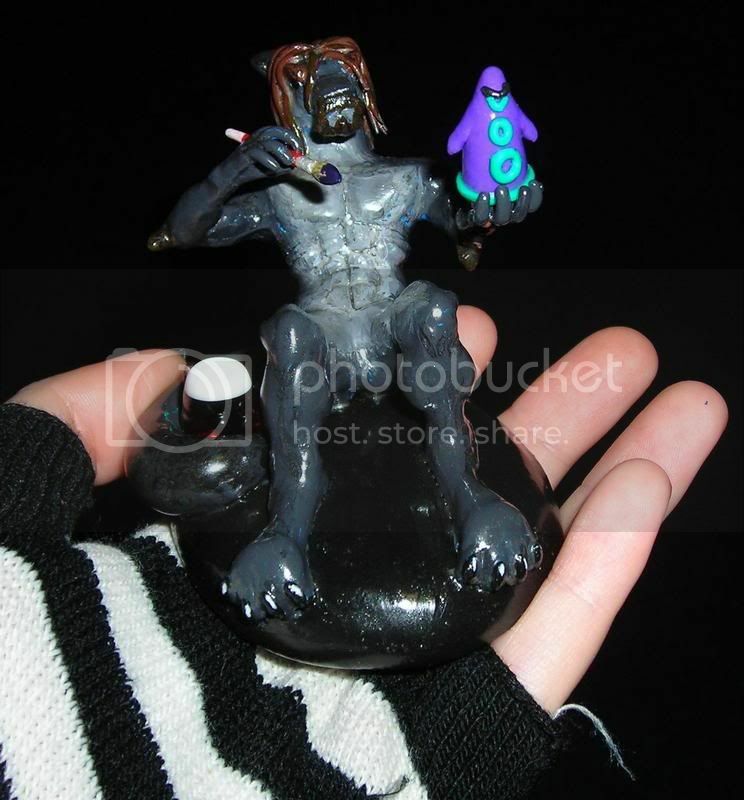 He made the base himself, and created the assorted rubble from bits of plastic. And painted the models himself with his very tiny paintbrushes. 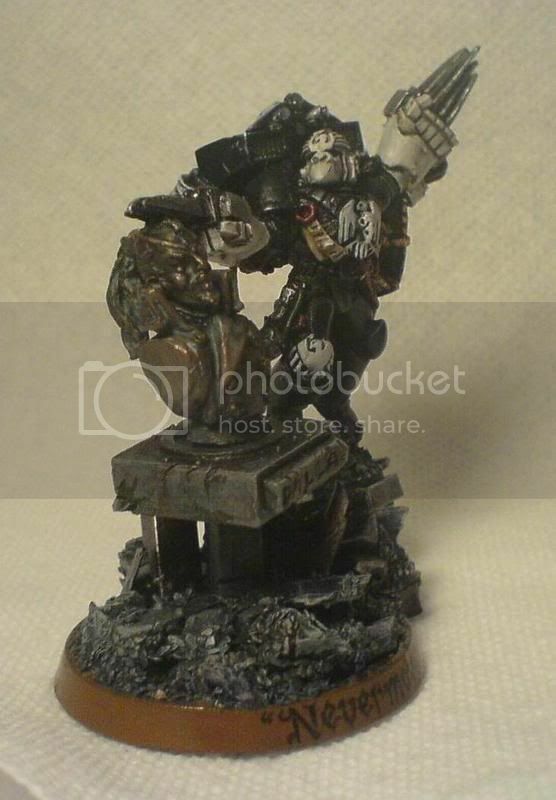 He then took the head of Inquisitor Duke Von Castellan, cut it off, and placed it on a bust that he procured from another model building. He then carefully carved the plaque, inscribed the (tiny) 'PALLAS' himself, and then set about painting the entire bust in many layers so that it appears to be made of real aged copper (which is called 'verdigris' in technical terms). 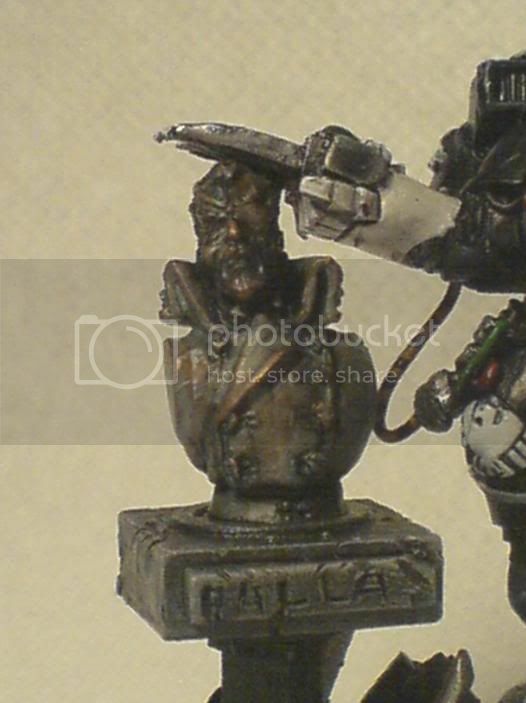 He then took the bust of Pallas, and attached it to the base. 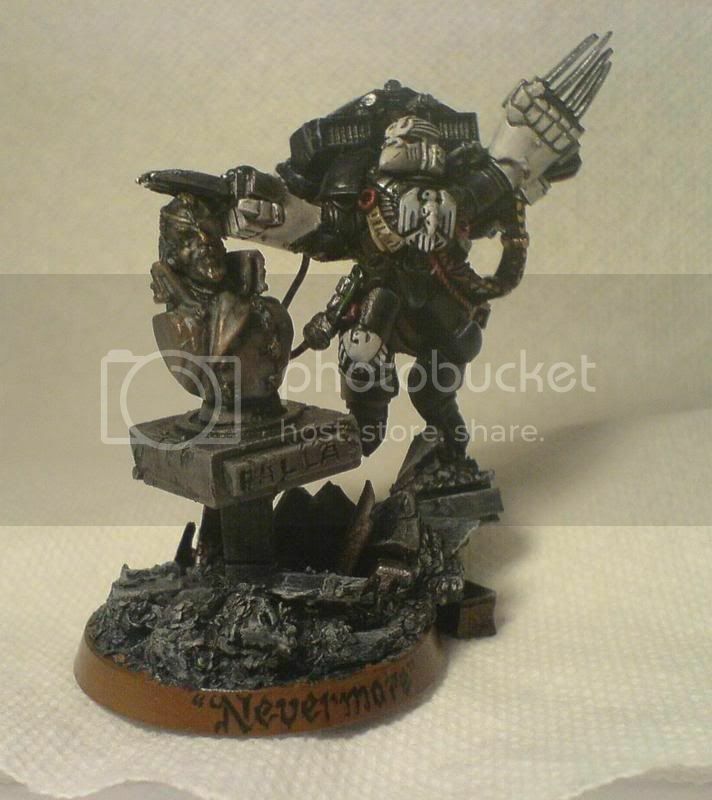 Then, taking the greatly modified Captain Shrike of the Raven Guard, he positioned him so that he was leaning on the bust, thus imitating The Raven of Poe's most famous poem. Whoa. Isn't it amazing? For me to say "Oh my GOD I LOVE IT." would fall far short of adequately expressing my adulation of such a tiny and truly special model. I have currently have three art trades going on. Yes, three, you bastards. How am I meant to get a degree and keep up with three art trades at the same time? I shall have to read with one hand and draw with the other, while somehow mastering the art of taking notes with my nose.